A daylong opportunity to explore how we work to craft a welcoming and inclusive school climate, to build a caring and supportive class community, and to empower and respect student voice. Despite the great diversity of the San Francisco Bay Area, we still face the challenges of segregation and prejudice, as well as inter-group tension and violence. Our children continue to grow up surrounded by stereotypes, often with little or no exposure to those different from themselves. This dangerous situation breeds ignorance and fear, feeding prejudice and hatred, which in turn fuel violence and further segregation. Bullying happens because of a simple human tendency – people who've been hurt tend to hurt other people. Many people believe they only have two options when faced with hurtful behavior: aggression or passivity. In this session, we will focus on the less familiar third option, assertiveness. Through a series of skits, exercises and games, participants will learn activities for teaching assertiveness to their students, tools for handling emotional and physical violence, and new insights into what it means to be a peacemaker. This presentation is designed for K-12 administrators and teachers, who strive to build an inclusive learning environment​ when interacting with Muslim students and their families. ING's mission is to counter prejudice and discrimination against American Muslims. Mindfulness is a practice that allows students and teachers to cultivate the skill of being present in moment-to-moment awareness and experience. This session will center on the definition, background and applications of mindfulness, specifically in the school setting. The presenter will share her story as to how she came to practice mindfulness and how she uses it in her classroom. A small practice section will accompany this section. About the Presenter: Lopez has been teaching in middle school for 10 years, utilizing various approaches to build a culture of peace with Non-violent Communication (NVC) and mindfulness. In her studies she has focused on Social Emotion Learning (SEL) programs and curriculums and discovered that the basic staple underlying all SEL programs is the capacity to be present. In this session, we will delve into research taken from a thesis study on the structures of support, cultural narratives, and educational barriers that influence Chicana/Latina students to pursue and persist in completing collegial study. This thesis study was carried out through the methodological process of testimonio (“personal testimony”), which allowed the presenter to analyze personal narratives and identify key sources of emotional and academic support, as well as educational barriers throughout the K-12 and university pipelines. The literature and personal testimonios will be discussed through a variety of interactive discussion formats such as individual writing and reflection, group writing and discussion, and a gallery walk of quotations allowing active movement and expression throughout the workshop. About the Presenter: Navarro has presented on this topic at the Latina Leadership Network Conference at Ohlone Community College and the Teachers for Social Justice Conference in San Francisco. Youth action interns from Oakland will introduce techniques they use to confront a growing culture of militarism in their schools and communities, accounting for new layers of violence. Drawing from a range of exercises that connect their physical experiences to the social/political world, presenters will guide the group through creative exploration of overcoming the war-like conditions in which we find ourselves, and how liberation arts comprise a strategy for both personal and societal transformation. ​In this workshop, you will learn how to identify your personal "hot buttons" and create a plan to recognize and diffuse them at the onset. Also, this interactive session will include skits, dialogue and "hands on practices" to develop strong communication skills, especially when confronting conflict. ​About the presenters: We work in urban environments where students are consistently triggered and re-traumatized. We provide sessions to increase student's ability to cope, develop their voice and advocate for themselves. Our programming includes high school youth leaders who facilitate violence prevention sessions to middle school students. Our presentation methods are interactive, developed through student leadership, and include multiple opportunities to try on learned methods. Educators will be able to support students in developing their conflict resolution skills to minimize classroom outbursts and dissension towards a more manageable classroom environment. ​Discovering how 80% of her third graders were living in bilingual or trilingual households (up to 18 different languages in 1 class!) pushed this presenter to seek a new structure for her art classes. Tackling both the needs of non-English speaking or new students, and the fear and rejection of the current ones, her lesson was centered on celebrating cultural heritage as a celebratory attribute in a child's early years. This year, she re-writes the lesson, targeting adults and focuses on three particular topics: making new students feel welcome by celebrating their heritage, learning by sharing family traditions, and creating an art project designed to engage students of all abilities and reinforce their sense of belonging. About the presenter: Pennington completed her M.A. in Art Education on the thesis topic of teaching in a multi-cultural/multi-ethnic class wherein the research question “How might student-centered and culture-specific art lessons engage students and increase mutual understanding and acceptance?”. She has experience teaching Art to both children and adults. This presentation is designed for teachers, parents and students of all ages trying to understand each other's communication and learning abilities. The making of a sacred space is designed to create an educational environment that is friendly, free of injustice, safe and which will inspire students to reach their highest educational goals. "Creando un espacio sagrado para aprender" es un taller para maestros, padres y estudiantes de toda edad interesados en comprender la capacidad de aprendizaje de otros. Esta presentacion les dara ideas para crear un lugar sagrado de aprendizaje libre de violencia, injusticia, respecto, sin miedo y amigable, adonde el estudiante esta inspirado a alcanzar su nivel mas alto de aprendizaje. 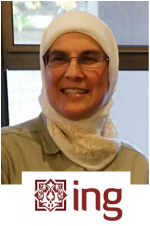 About the presenter: Salazar works with Interfaith Women's Circle, United Nations "United Religions Initiative"(URI) and she is part of the Interfaith Climate Action Network and a Contra Costa Interfaith Council member. She's also an interpreter for National Alliance on Mental Illness. As an accredited public speaker and advocate, she works towards peace, social justice and student achievement​. On Top of Things is an innovative and uplifting program that fosters self-discovery, cooperation, and appreciation of others. It increases language skills while providing a much needed tool for schools and organizations who wish to integrate positive values into the classroom. Lessons focus on the colorful and unique characters in the book “Little Bear Learns to Fly”. Within each lesson vocabulary, reading, listening, and speaking skills are learned through experiential activities involving music, art, and movement. Participants can expect to create, share, and have fun! An ever-growing need exists for innovative educational programs that support what many experts know to be true: children learn best and teachers teach best in an atmosphere that encourages cooperation, self-respect, and an appreciation of others. Children need to develop a deeper sense of their self-worth and creativity. Teachers deserve the training, materials, and support necessary to create an environment where that can happen. On Top of Things addresses these urgent needs. This presentation is geared towards teachers of K-2nd grade students. About the presenter: Martin had extensive experience in presenting the "On Top of Things" program together with the training of teachers in use of the program. Most recently, she presented and subsequently trained kindergarten and first grade teachers at Richmond College Preparatory School. Jan Knight, Mentor and Coach for Beginning Teacher Support and Assessment, Contra Costa Office of Education, sponsored and supervised the program. ​from Mt. Diablo High School's Sustainable Hospitality program. Many thanks!